In 1972, Italian confectioner Ferrero introduced one of its biggest hits: the Kinder Surprise. It’s a chocolate egg with a little toy contained inside. It’s wildly popular everywhere in the world, but in the United States it is banned due to choking concerns and because of the US’s general distaste for non-food items crammed into food. 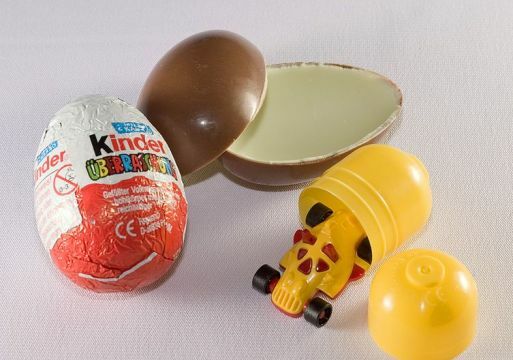 When coming into the United States from Canada, Lind Bird was threatened with a $300 fine after bringing back a Kinder Surprise chocolate egg with a toy inside. I guess this egg’s surprise was the amount of the fine! It is ridiculous, but this is the country that is actively trying to ban the Happy Meal and has food police on every corner, banning trans-fats and trying to get kids to eat things that are healthy, not delicious. What else would you expect?